I wasn’t sure whether to call it a wheel or a clock-face, but since there are 24 MVP Visio 2010 sessions (see http://visio.microsoft.com/mvpsessions ) I decided on a wheel … so in this blog I present my alternative interface into these sessions, created in Visio of course! I created an Excel workbook in which I listed all of the sessions, their descriptions, and links to the video and any supporting files. I then created the wheel diagram, and used Link Data to Shapes to automatically add Shape Data rows and hyperlinks to each shape, and Data Graphics to automatically colour each shape. Finally, I saved the Visio page as web pages (VML, XAML and SVG format output), and as pdf. I have often linked Excel worksheets and ranges to Visio over the years. I used the Database Wizard initially, but have been using the Link Data to Shapes feature since Visio 2007. I had noticed that I sometimes didn’t get a full list of the available ranges when trying to link in Visio, so I decided to investigate why. 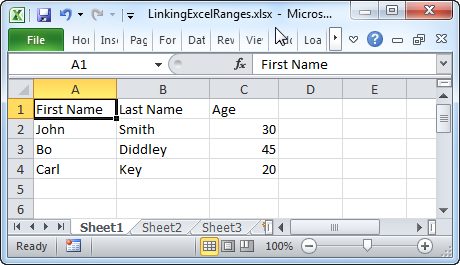 Firstly, I created a sample Excel 2010 worksheet with a header row, and three rows of data in Sheet1.